'Intricate and crisp, witty and solemn: a book with special and dangerous properties,' Hilary Mantel 'Baroque, Byzantine and beautiful - not to mention bold' M.R. Carey Rotherweird is twisted, arcane murder-mystery with shades of Deborah Harkness, Hope Mirrlees and Ben Aaronovitch, Mervyn Peake and Edward Gorey at their disturbing best. The town of Rotherweird stands alone - there are no guidebooks, despite the fascinating and diverse architectural styles cramming the narrow streets, the avant garde science and offbeat customs. Cast adrift from the rest of England by Elizabeth I, Rotherweird's independence is subject to one disturbing condition: nobody, but nobody, studies the town or its history. For beneath the enchanting surface lurks a secret so dark that it must never be rediscovered, still less reused. But secrets have a way of leaking out. Two inquisitive outsiders have arrived: Jonah Oblong, to teach modern history at Rotherweird School (nothing local and nothing before 1800), and the sinister billionaire Sir Veronal Slickstone, who has somehow got permission to renovate the town's long-derelict Manor House. Slickstone and Oblong, though driven by conflicting motives, both strive to connect past and present, until they and their allies are drawn into a race against time - and each other. The consequences will be lethal and apocalyptic. Welcome to Rotherweird! Rotherweird by Andrew Caldecott really is quite a strange book and not in a bad way. Rotherweird is in England but is not part of it. For centuries it has been isolated from the rest of the country. It has its own customs and laws. The fact that the study of its history is banned is one of those laws and a key to this story. The arrival of a new history teacher at the school – an “outsider” – is significant as is the fact that a wealthy outsider has moved into an old property in the town. In the main the story plays out in current time. However there are sections where the history of Rotherweird is gradually teased out as well as the reasons for its isolation. The whole story is actually strange. However it is also intriguing, wide ranging and very inventive too. Some of the time it follows Oblong (the new history teacher) and his discovery of aspects of the town’s history. There are far stranger characters than him roaming the pages of this book. It is wonderfully rich but you must not lose concentration or you may miss something important. 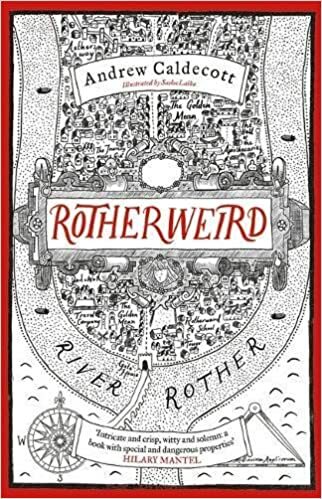 While I really enjoyed reading Rotherweird I do have a few small reservations about it. A combination of the number of characters and the relatively complex story does mean you really do need to pay attention when reading. There are one or two people in the story about whom I feel I never did work out their stories fully for example. I mostly enjoyed the humour in it however there are moments that have a childishness to the humour for me. One of the inventions in the book had a real “Heath Robinson” feel to it – I could almost see the cartoon – and it felt a bit like an afterthought. I never really got the background involvement of Druids in the story either. At times it felt a little disjointed too. That said this is one of the most appealing and fascinating books I’ve read in some time now. There is darkness and humour here together with invention and originality. For me there are echoes of the work of both Mervyn Peake and Neil Gaiman here. Rotherweird is a place where we can know nothing about the past, the present is strange and the future looks uncomfortable to say the least. This is another England and “another place” and I want to read the next book!